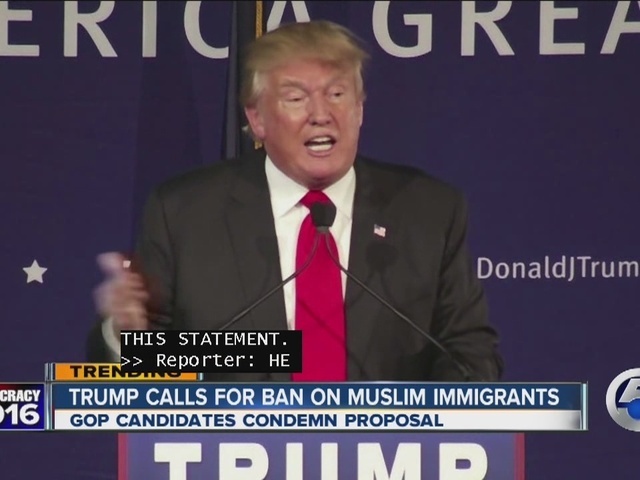 Trump calls for no more Muslims entering U.S.
Julia Shearson is the executive director for the Council on American-Islamic Relations (CAIR) in Cleveland. She said she was shocked, but not surprised by Trump's latest proposal — and believes it may actually help him. "The way Mr. Trump is stirring people up gives them a kind of quick fix and a quick solution so unfortunately, I think his poll numbers will certain jump because of this," she said. Robert Frost, chair of the Republican Party of Cuyahoga County, said candidates shouldn't make statements such as Trump's and expect foreign governments to respect American's requests to be treated fairly abroad. "Freedom from religious tests is the main reason early settlers came to this country from Europe," he added. Trump's Republican rivals were quick to reject the latest provocation from a candidate who has delivered no shortage of them. But at a Trump rally in Mount Pleasant, South Carolina, on Monday night, the proposed ban struck supporter Shelley Choquette as reasonable, because "It's not going to be forever. I think everybody needs to be checked." On Capitol Hill, Republican Sen. John McCain of Arizona said, "It's just foolish." Associated Press writers Mark Sherman, Laurie Kellman, Josh Lederman and Alan Fram in Washington and Bruce Smith and Bill Barrow in South Carolina contributed to this report.